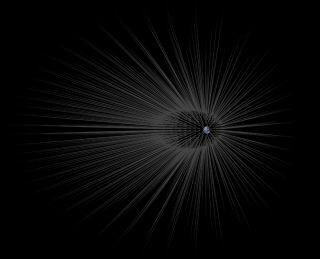 This artist’s illustration shows dark matter “hairs” surrounding Earth. Earth may sport a thick coat of superlong dark matter "hairs," a new study suggests. Astronomers think dark matter — a mysterious, invisible substance that neither emits nor absorbs light, and is about six times more common than "normal" matter — forms fine-grained but incredibly long streams throughout the universe. In the case of Earth, the root of such hairs would lie about 600,000 miles (1 million kilometers) from the planet's surface, while the tip would be about twice as far away — 1.2 million miles (2 million km) from Earth. (For perspective, the moon orbits Earth at an average distance of 239,000 miles, or 385,000 km). This artist’s illustration shows a close-up rendering of possible dark matter “hairs” surrounding Earth. The new study, published in The Astrophysical Journal, further suggests that the different layers of a planet, moon or other body should cause corresponding bends or "kinks" in these dark matter hairs, which researchers could also put to use. While dark matter is much more abundant than regular matter, scientists think the invisible stuff makes up just 27 percent of all matter and energy in the universe. The vast majority is composed of dark energy, a mysterious force associated with the universe's accelerating expansion. "Normal" matter makes up just 5 percent of the cosmos.